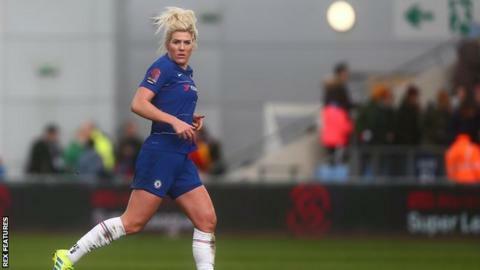 Chelsea defender Millie Bright has been ruled out of Phil Neville's England squad for the SheBelieves Cup as she undergoes treatment for an injury. Bright, 25, is having the treatment now in order to ensure she is fit for the World Cup in June. Manchester City defender Gemma Bonner replaces Bright in Neville's 23-player squad for the tournament, which starts in the United States later this month. England finished second in last season's competition after recording a 4-1 win over France - Neville's first match as head coach - and drawing 2-2 with Germany, before slipping to a 1-0 defeat by the US in the decider. Bright played the full 90 minutes in Chelsea's FA Cup win over Arsenal on Sunday but is not expected to take part in the Blues' home league game against Bristol City on Wednesday. The centre-back and Reading midfielder Jade Moore, 28, are to remain with their clubs as part of the long-term management of their planned return to full fitness. Fellow Reading midfielder Fara Williams and forward Chioma Ubogagu, who previously played for the US Under-23 team, miss out, as does Manchester City forward Mel Lawley. But head coach Neville said: "It's important to note the door is not shut to any player with ambitions of making the World Cup squad. "It's obviously disappointing for Millie to miss out on the SheBelieves Cup through injury, but our priority - and Millie's - is to manage her rehabilitation very carefully. "We are taking a long-term approach to her recovery process to ensure she is back to full fitness in time for this summer's World Cup in France. "Jade has shown great strength to overcome a long-term injury. After being out for a year-and-a-half, we all agree that her focus should be on returning to full fitness and finishing the season strongly with Reading. "We're all looking forward to meeting up and everyone is ready and raring to go. These are exciting times ahead and this is a huge year for the Lionesses."